Vancouver is known as Hollywood North thanks to our friendly tax breaks or California tax gouging depending on your perspective. Many TV shows and movies get filmed at UBC — a lush green campus with old stone buildings that easily passes off as an Ivy League school to the south, or Cambridge or Oxford in England. 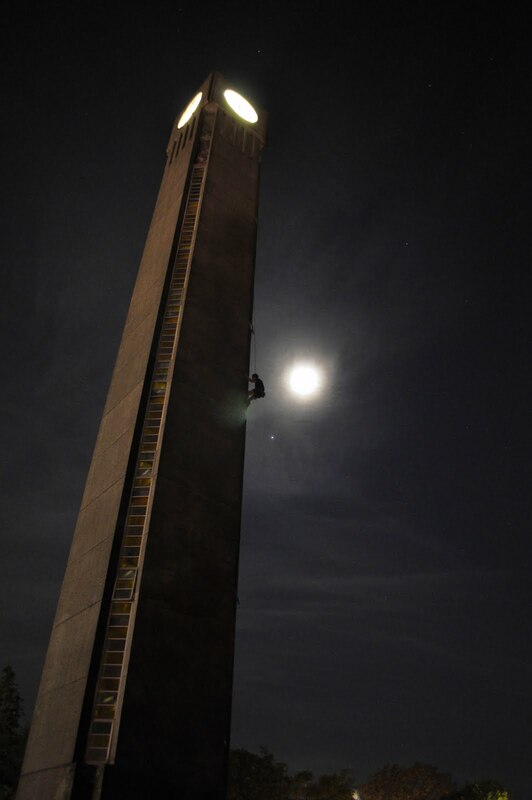 [pullquote align=”right” cite=”” link=”” color=”” class=”” size=””]The prominence of the Clock Tower makes it a long standing objective for campus cragrats — wishing to defile her face, sit upon the summit, take in the view, and swing off the clock hands like a Harold Lloyd movie. [/pullquote]At the center of campus, the UBC Clock Tower stands proudly next to the most filmed building on campus: the Main Library. Most directors edit the tower out of the shot, as its 1950s concrete Brutalist architecture doesn’t fit with the classic Tudor stylings of the library. However; there is one episode of the X-Files that uses the tower as a focal point to the story, with interior shots as well. It’s this Brutalist concrete architecture thrown in sporadically around campus that make UBC a mecca for builderers. 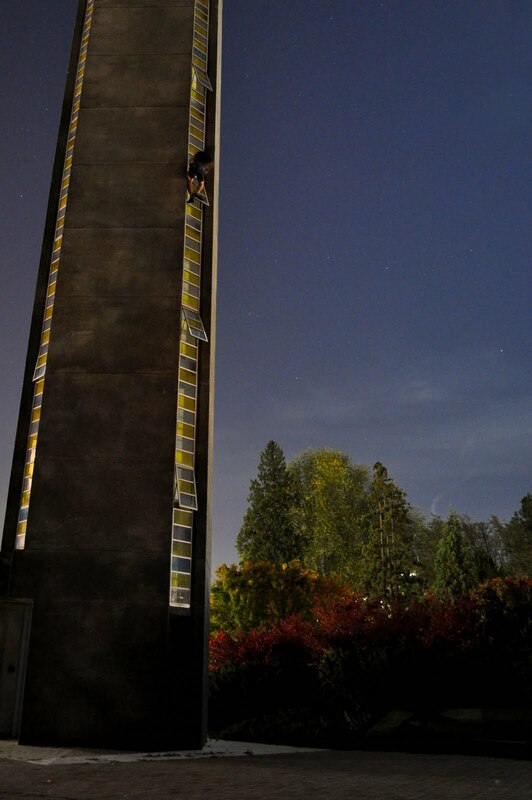 The prominence of the Clock Tower makes it a long standing objective for campus cragrats — wishing to defile her face, sit upon the summit, take in the view, and swing off the clock hands like a Harold Lloyd movie. However at 120 ft with little to no features to hold on to and no way to protect it, most give it a quick look over and move on. There is a fun boulder problem at its base and that’s about it. Yesterday, local climbing phenom Grant McGranterson (last name changed to protect the guilty) made history by achieving something previously thought impossible. 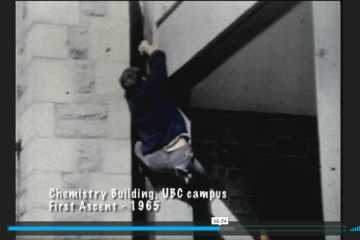 A rare usage of the UBC clock tower in film. See 11 seconds in. Grant, Meg, and I received a tip that something had recently changed with the tower: a second story window was uncharacteristically left open. This allowed us to gain inside access with moderate difficulty. Once inside we were able to throw down a rope from the top of the blue and yellow windows. Access to the top observation deck, the same area the gunman shoots people from in the X-File episode, was locked. Hence a full ascent past the clock face would require some difficult leading, facing a factor two fall onto a rope running over the edge of a window pane. However; the moves appear to be there, with what looks to be a lovely finger crack in the final section — although these cracks are often filled with grout. Grant roped up. 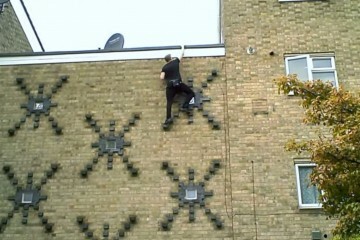 Getting to the top of the windows is no easy feat itself. 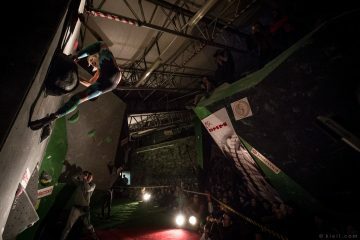 It requires a lot of chimney, drop knee, and gaston techniques that Grant described as a “Lynn Hill Changing Corners techniques.” Grant eked out an ascent to the top of the windows, but not without some hangs. He’s a solid 5.12+ Squamish trad climber. It’s some truly some hard stuff. I gave it a go, and my miserable 20ft of progress can attest to this. So there you have it. As the aforementioned Lynn Hill boasted after her first free ascent of The Nose, “It goes, boys.” Now someone get up there and send it clean. the guy on pic1 looks unsecured…is he? already a scary hight! how is the descend? the same way down or through a window? Pipe – It was definitely a roped ascent.